djkardkreations: NBUS Challenge #12 ~ BONUS LAST DAY! NBUS Challenge #12 ~ BONUS LAST DAY! Welcome to the Bonus Day of NBUS Challenge #12! If you are just arriving at the challenge, please see Day One for all the pertinent information. If you're a veteran NBUS challenger and you have a card to enter, the linky tool is below! And that, ladies and gentlemen, pretty much encapsulates life in the Playhouse for me and Hammy!! Now you see why they fell off my face in the first photo! These are loaner glasses from Barbie. I scratched mine on my trip so they're in the shop for repair. The NBUS comment over my head is from Funny Bones by Riley & Company. Hammy's comment is unmarked. You can tell I hand drew the bubble around it and I didn't do a very good job. It was the very last thing I did on the card, (naturally), so I stopped messing with it before I completely botched it. 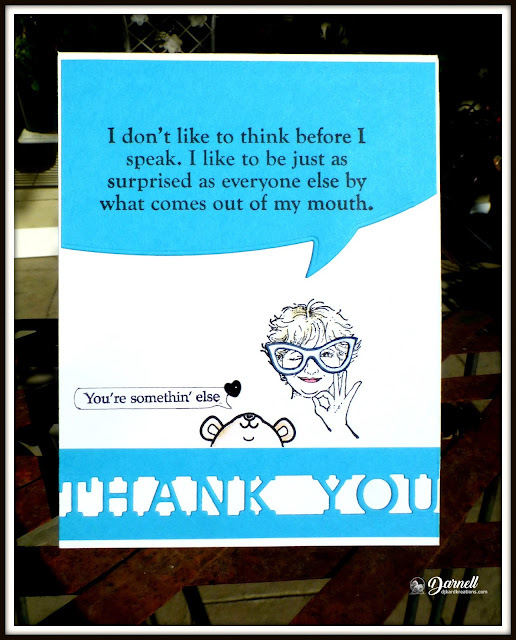 The NBUS Thank You Channel die is from Poppystamps. I truly do thank you for your excitement, enthusiasm, and encredible entries in my little challenge to eradicate Never-Before-Used-Schtuff from our craft rooms! Hammy and I hope you've enjoyed the smiles and laughs we've provided the last eleven days with our NBUS creations. The fact that we have over 300 entries and the challenge still has a day left tells us that you have enjoyed digging your way through your own NBUS mountains and that makes us very happy! We hope you continue to use your NBUS, even without a challenge. It's great to see you identifying NBUS this and NBUS that in your posts throughout Blogland! So. I have to ask: has your NBUS Mountain grown as a result of this challenge? Mine certainly has! Over the years I've had friends ask how I can still have any NBUS? Seriously?! I think there must have been fifteen new stamp companies start up this year!! "... If I were to win, I'd like one of the gift certificates to buy some adhesive to glue my billfold shut!" Haha! We are still laughing at how funny that is! In fact, Lucy is getting her own $25 gift certificate in a surprise new prize category called, "Hammy's Favorite Comment!" The rest of you will have to wait a few days for the prizes to be announced. We had a surge of entries the last three days and I want to get to everyone before calling in the Doc and his Missus to hold the random drawing! Good luck, everyone, and thank you again! Mwah!! Off you go now! You've got until 11:55 p.m. PDT tonight to enter your NBUS creation!! And please don't forget to visit the other entries in the gallery and leave them some love and thanks for their cool design ideas! Enjoy the challenge! No, seriously, enjoy! Wow! Super cute! Really enjoyed all your beautiful creations along with NBUS challenge! Darnell I really get your humour - love your card(s)!! Umm, yes, I too identify with Lucy's comment :-). and really, my NBUS schtuff is still growing - I don't know what goes on out in my studio when I turn my back!! I am totally going to have to come and raid your sediment drawer, you've showcased some amazing ones this week and made fab cards with them. I love Lucy's comment (and Hammy's generous response!). Fabulous cards and just perfect to finish off the challenge ... What a super lady you are! Loved all of your awesome cards!! Also loved all of your cute sentiments!! Hahahahahaha! Last things first... Lucy's comment... way too funny! She speaks for all of us, but it will probably never happen. On my last entry I used three NBUS dies, but have since ordered four new sets. That's no progress at all! There was one die I just had to have, but went for the free shipping. You know how it goes, sheesh. Anyway... you have two more fantastically funny and awesome cards today! It's so cute that you included Hammy in there. It's been tons of fun seeing all the NBUS from everyone. I hope we can all keep up the momentum. Thanks for a fun challenge, and I'm glad I got to play this time! Woot!. You're such a star. There certainly has been a surge of entries since yesterday, even. You picked the best for last, in my view. Love these images, the glasses and that hilarious sentiment. What am I going to do without my daily dose of giggles (insert heavy sigh). So fun! I'm about to share another NBUS card at my blog and with a punny sentiment too! I'm really trying to be a good girl and continue to use my schtuff instead of buying (too much) new schtuff. It does help if you have to pay import taxes and VAT on two parcels in two days. Hmm, that sort of contradicts my previous remark about not buying new schtuff, doesn't it? Oh well, I'll try not to buy any more schtuff until the next Black Friday sales. How's that for determination? Thanks for putting a smile on all of our faces. Hope we are giving you reason to smile as well. Of course my Mt NBUS is growing(!) 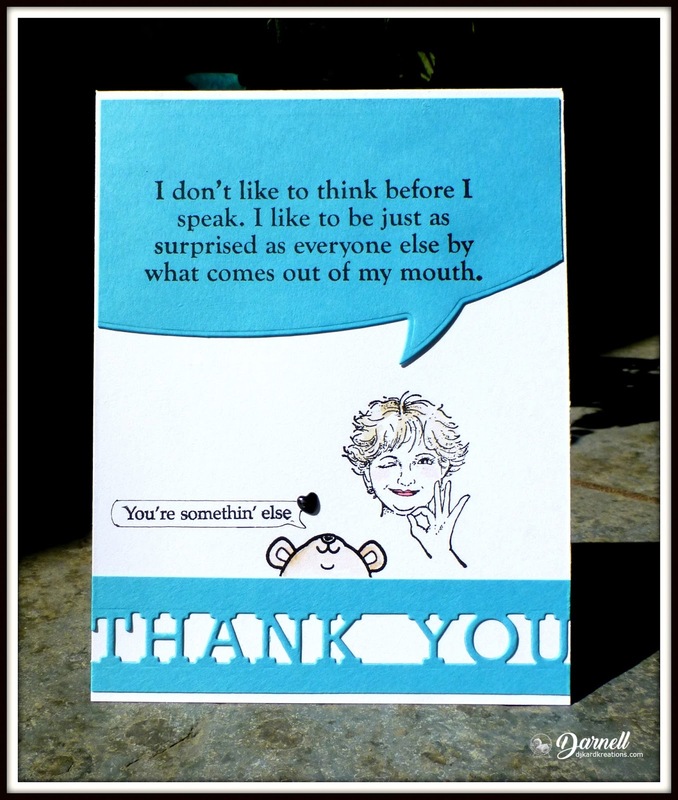 Checking out not only your fabulous cards, Darnell, but also the #335+ entries you have already! There are so many stamps/sentiments/die cuts/embossing folders and crafty schtuff I absolutely have to have now! Thanks a lot y'all!! You're definitely something else. :) Love your cute card and your posts. I so enjoy reading them. Love that card Darnell and I've really enjoyed seeing all of your humorous creations for the challenge. I wish I could promise to use all my NBUS before I buy any more but I'm off to the Port Sunlight show on Saturday and I just know that new products will be throwing themselves into my bag when I'm not looking. I'm sad to see the challenge end but there have been so many fabulous entries! I have received 2 pkg this week alone! Haven't even taken them of the pkg yet. I agree with Lucy! She is one smart cookie! You must be exhausted! Have loved every single card you've posted....love the sediment stamps you've used, all of them have made me grin hugely. Great works, gal!! Thanks, Darnell, for a fun challenge once again. I should set a challenge like this for myself and not allow any OLD stuff until all the NEW stuff has seen the light of day! Thanks, for a great challenge, Darnell - and lots of laughs!! I love Lucy's comment (good for her, BTW), but know I couldn't do it myself. We are all such enablers. Fabulous card, love the sentiment! Lucy's comment is way too funny, lol. Thanks for a wonderful challenge, with hilarious cards and lots of laughs!!!! Nope, my NBUS has not grown cuz of you...is my own fault! LOL Thanks so much for your challenge to use the stuff. Hi to Hammy! My NBUS is smaller. I am trying to make an effort to use as I receive (although some NBUS not used to date is rather old). Maybe I should adopt the FIFO principal? Another fantastic fun card. You have made this such a fun way to use all our NBUS items. But as most know, there seems to be a never-ending supply of them. I know I still have a long ways to go. Some stamp sets only had one of them inked up. I agree with that gal who said she needed a gift certificate to buy glue to glue her billfold shut. LOL That was hilarious! Thanks so much for all the fun. I tried to comment on a lot of the designs made but alas my internet has been lousy and so I am afraid I will not be able to check all out. But I will look at as many as I can. 12 days of cute and clever cards! Your creativity always amazes me! Thank you so much for these challenges! Hehe, this is another giggle worthy card! Thanks for all of the smiles this go around Darnell! You are the bee's knees!! Certainly have enjoyed your humorous blog posts! Thank you for giving us this challenge--I do enjoy the motivation to find a way to use my NBUS! Lucy's comment is PERFECT--definitely made me LOL!!! Hugs to you!!!! I enjoy your posts even without the NBUS challenge, Darnell. You and Hammy are always entertaining. Case in point, the cards you've created for our amusement during the last 12 days. Thanks for all you do to encourage us to use our NBUS and for hosting this wonderful challenge. Darnell, your NBUS challenges are so fun and you are and Hammy are so entertaining! 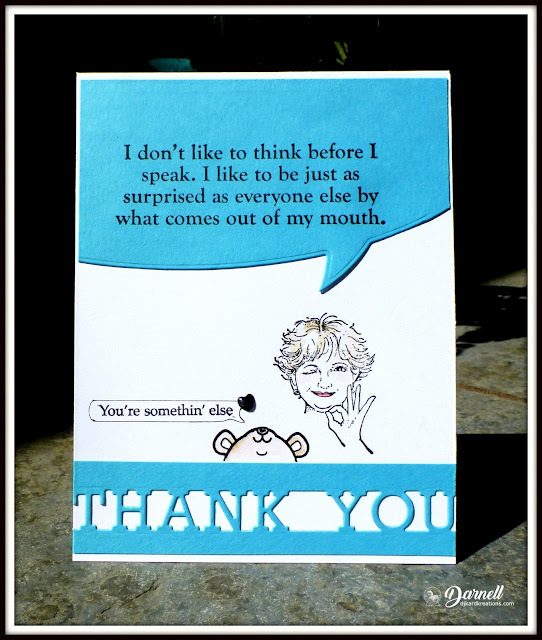 I have enjoyed all of your humorous and snarky cards-your sediments are too funny! I am so honored and excited that you awarded me with the first ever “Hammy’s Favorite Comment” award! I only ask one thing-please don’t let my dear husband know that I ever said I would glue my billfold shut-he might hold me to it! Congratulations on another fantastic NBUS challenge. I would love to have joined in but life got in the way. Hopefully, next time. Your cards today were awesome. Love humorous cards, and yours are the best! Two more great cards. Thanks as always to you and Hammy for being such gracious hosts. Thanks for some fun and funny few days. Oh my gosh--that comment does indeed deserve a prize & yes, she speaks for so many of us! Honestly, my NBUS doesn't grow because of the challenges you have, Darnell, but they have made me think all the time that I really do need to use what I have--so thank you!! Hilarious sentiment & fun card today! brilliant cards yet again and such brilliant sediments also. Love Hammy peeking out of the second. Please take a look at him I think he is gorgeous just like your Hammy. Wish someone would do funny stamps over here. Congratulations on another successful NBUS challenge and what a generous gal you are. Congratulation to you and Hammy for so many entries on NBUS. I think, we all have a few more of NBUS stuff. :-) And there is always an excuse to buy new to be used on your challenge. :-) Thank you for the daily dose of smile during the challenge. Fabulous send off snark for the bonus day Darnell. Thanks so much for the giggles. I needed the laughs. Thank you for putting a smile on my face for the last 11 days! Today's card did it again. And congratulations on another successful NBUS challenge! Lucy definitely deserves her own prize for that hilarious comment! I should probably tape mine shut too but where then would the fun be? Okay, I NEED that sentiment on a T-shirt!!! Your two cards are FANTASTIC!!!!! Love your face stamp-is that really you? So cool!! !